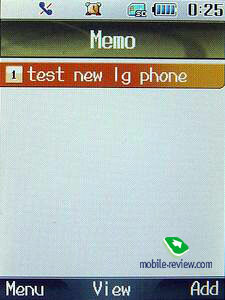 This is not a GSM-handset, therefore it's not available for the European markets, including the Russian one. A year ago our readers had a chance to take a closer look at the first handset, featuring a 5 mpix camera – particularly it was Samsung SCH-S250 . 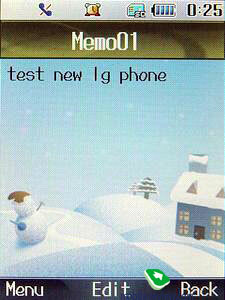 Today we're offering you one more review of another device with 5 mpix camera onboard – this time manufactured by LG. This very model has a number of indexes, e.g. 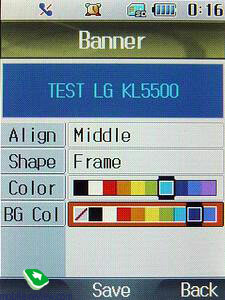 LG SV550 - non-operator index, and the mobile operators gave it the name of LG KV5500, LG LP5500 (LG TeleCom). The core difference between the latter two devices is the menu's appearance and the label itself, but not the functionality. 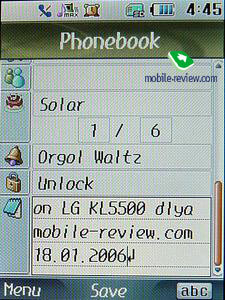 Since the version we are currently reviewing has been released for LG Telecom mobile operator, we will accordingly use LG LP5500 index. 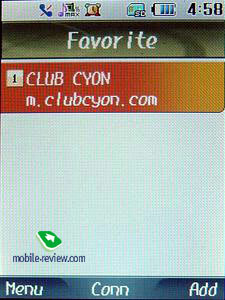 But let's get straight down to the review and, actually, the reason why we decided to test this handset. Similar to Samsung SCH-S250 case, LG is intending to introduce its own top mode, which will operate using standard GSM bands, into the European market. Though it's hard to predict what will change for the better and what for the worse, all we can do at present is to evaluate the potential, concealed in the device. 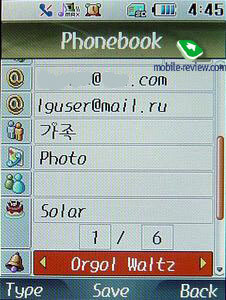 LG LP5500 works in CDMA 2000 1x EV-DO (the third generation of networks) networks at 2,4 MHz frequency. To begin with, in order to handle pictures, taken in the maximal resolution, and other resource-intensive tasks, like 3D Java, big screen, the handset needs a fast CPU. 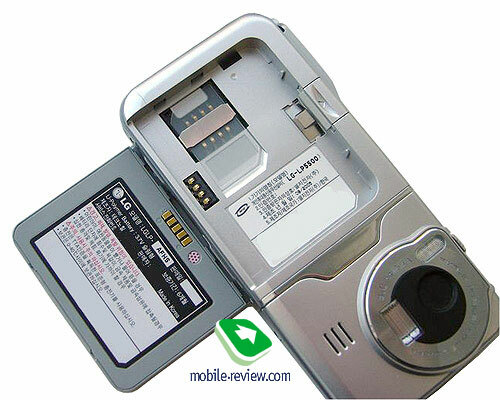 The device has chipsets by QualComm built in – the main of which is indexed as MSM6500. 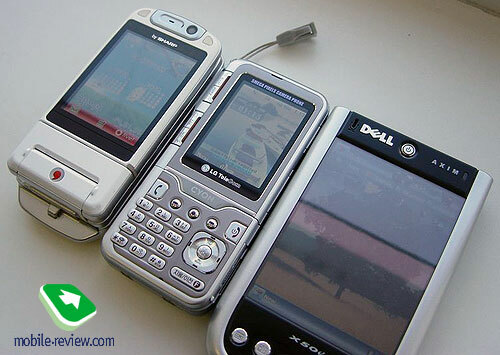 It was announced in San-Diego on the 9 of July, 2003 (check out the press-release ), however the development of the chipset representing the new generator had been underway since the end of 2001. 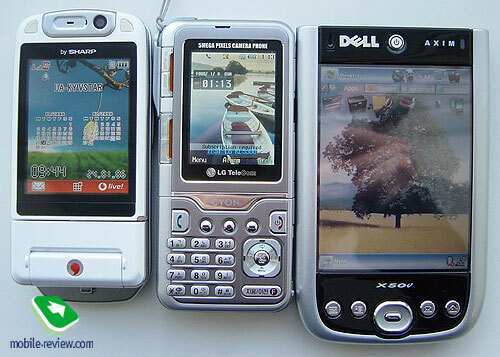 To have a better idea of the QualComm's capabilities, let's get back into the days and look what we were to expect. 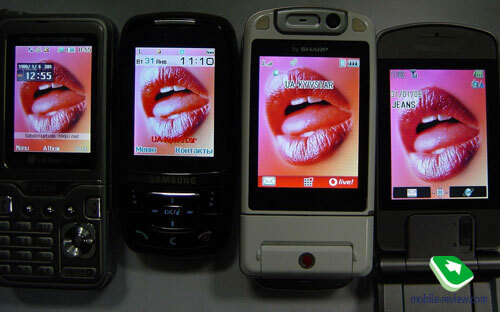 At the release the chipset had an overwhelming potential – it could be integrated into mobile phones, PDA, smarthphones and so on. 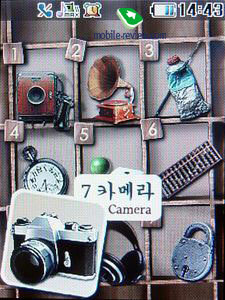 The camera's interface was almost alike the one, used in digital cameras. With USB On-The-Go (OTG) host-controller it could work directly with a digital camera, printer, keyboard or CD-ROM, all this owing to USB 2.0 interface. 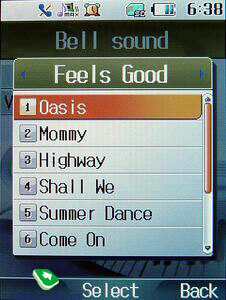 Unfortunately LG preferred its usual interface to the potential of the chipset. At the first glance it may seem that usage of an old chipset for new models is an archaism. But you shouldn't miss the fact, that as a rule the time span between the actual idea and the release is equal to one or even two years. 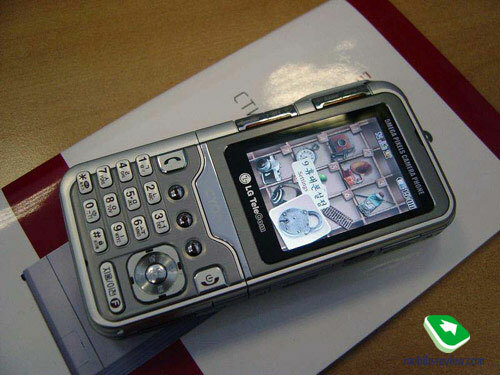 For instance, Siemens SXG75 which has been introduced into the market in the beginning of 2006 is powered by MSM6250 chipset, or the other product by a Korean manufacturer - Pantech&Curitel IM U-100, which is armed with MSM6500 as well. The most remarkable specifications of the model by Pantech are: a display with 15:9 sides ratio (quite strange, because if the manufacturer wanted to optimize the display for playing back wide-screen clips, it would apply the ratio of 16:9, just as in TV) and 2.6 inch diagonal, featuring the resolution of 240x320 pixels, a built-in 2 mpix camera and 3x optical zoom, also its users can receive and record TV digital video signals. 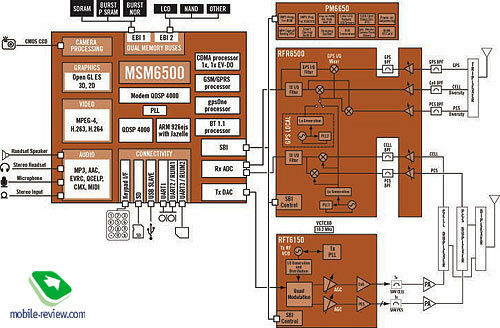 Comparison of chipsets: MSM6250, MSM6500, MSM7600 can be found by following this link . 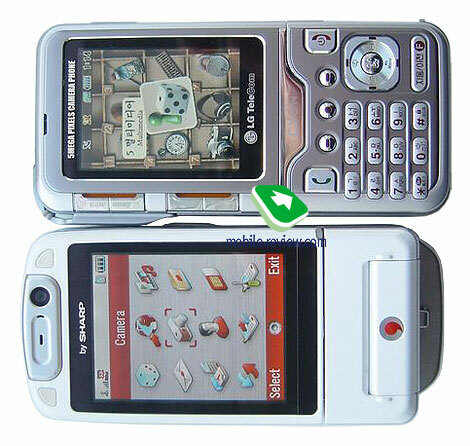 On the face of it the device is a candybar-shaped handset, well it has this appearance during the most part of its lifetime, but in fact LP5500 has two parts. 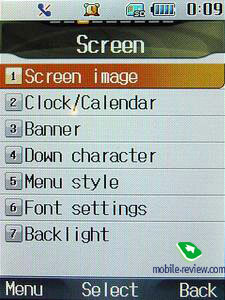 The first one is the screen itself and the second one includes everything that is located below. And exactly the lower part is turned round the upper one. On the one hand you can find functional, numeric keys and a navigating key, made in the form of a square with rounded corners; and on the other – the object-glass. It's made in order to let you both make a picture of yourself and use video call mode. When rotating the lower part, the picture turns over. 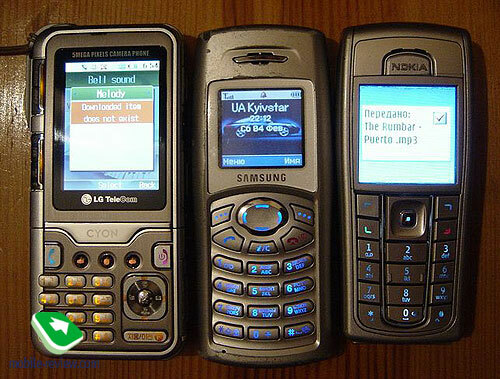 This cell design had been unique for quite a while, until Nokia 3250 got announced. 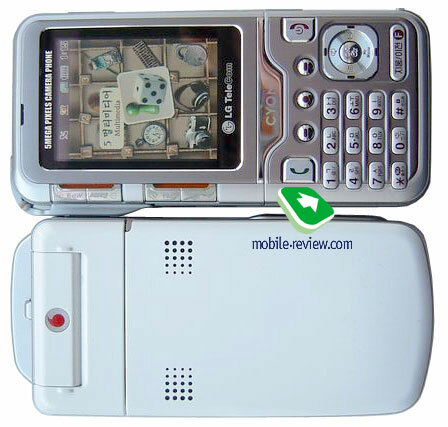 Basically the Koreans are keen on inventing something unseen before – for instance Pantech&Curitel PT S110, which has its display located on the sliding part and can be rotated by 90 degrees. 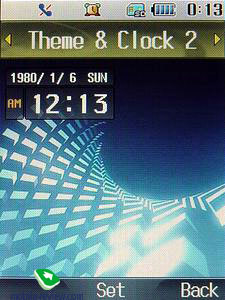 The design is made in Hi-Tech style. 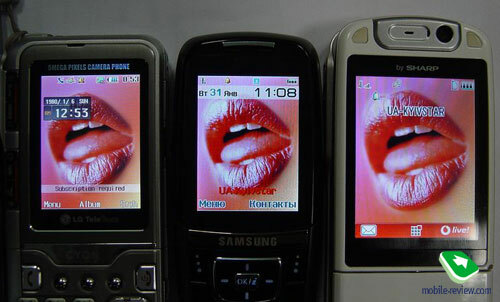 Measuring 108.6 х 50.5 х 18.4 mm, the handset has approximate weight of 150 grams, it's not the exact value though, since the manufacturer conceals this information. But taking into account presence of metallic parts in the cell, this weigh can be put up with, however they are digital cameras featuring lower weight. When holding the handset in hands, you feel all the solidity of the cell – no trace of creaks or gaps at all. Specially colored plastic makes up an impression that what you are holding is a piece of metal. 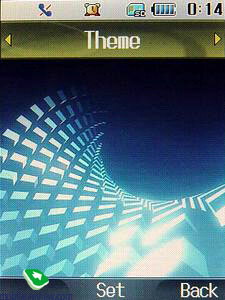 But in the reality the only part made of metal is the ledge on the left side, where the camera's button is situated. Moreover, the way this ledge is made, provides you the possibility of attaching a strip there. To tell the truth not so many will find it comfortable to carry such a heavy device using a strip, though as to me, I didn't feel any discomfort – maybe because I'm used to weighty handsets. Under the camera's button one can find keys for adjusting volume in call mode and in stand-by, also they are used while surfing the menu in case the navigating key doesn't suit you. 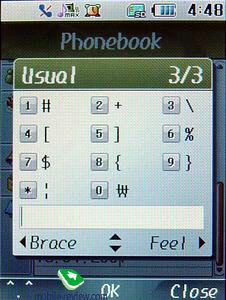 On the contrary, the adverse side has no buttons at all but holds the cutoff points. 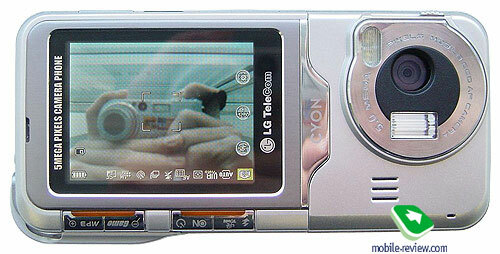 This is more likely dictated by the necessity, since this side is the best for putting the handset on, when shooting with timer. On the upper side there is a slot for connecting stereo-handset with 3.5 mm headphones adapter. 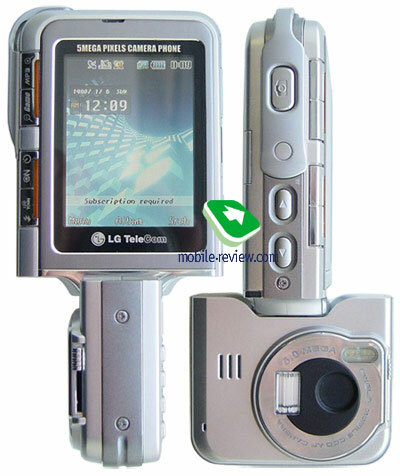 The design of the slot allows user to apply any types of headphones, despite the other cutoff points, materialized in LG M4410, F1200, where due to peculiarities of the design it is hard to find fitting headphones. Besides the slot can be also used for connecting TV-cable (included in the standard kit), if you have the desire of watching media-content of the phone on your TV set. 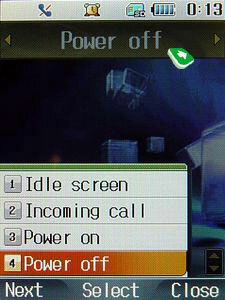 Under this cutoff point, an IrDA port found its place, even lower – a common for all LG handsets interface slot, used for plugging in USB-cable or charger. And at the very bottom you can see the miniSD slot – notable that all cutoff points are sealed with stubs made of strong plastic, firmly attached to the cell. 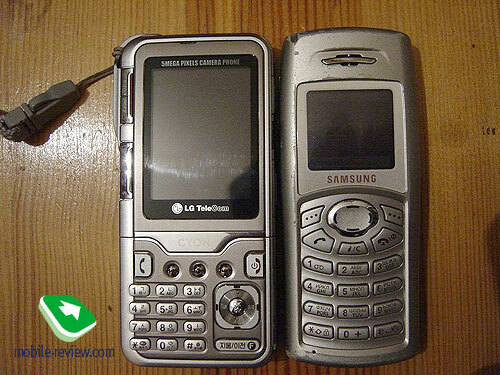 The upper part lacks any buttons and slots, but instead has a "QualComm 3G CDMA" sticker applied on it. 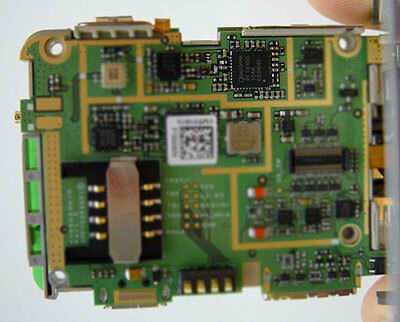 And on the lower part you will find a cutoff point for connecting the device to cradle, where it can be recharged and/or synchronized with PC. 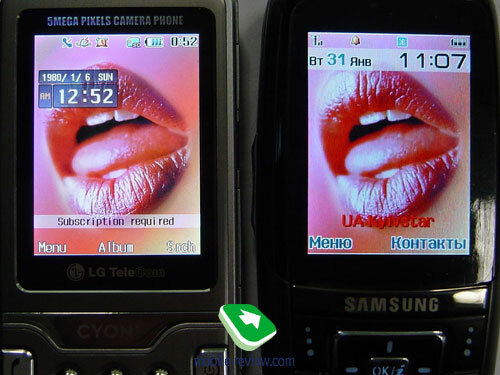 The front of the handset is the most spectacular – the first thing drawing your attention is the display, which adopts all features of LG top models', which are on sale in our country. Displaying up to 262K colors and having the diagonal of 2 inches (32x40mm) this device has 240x320 pixels resolution that makes all the difference. 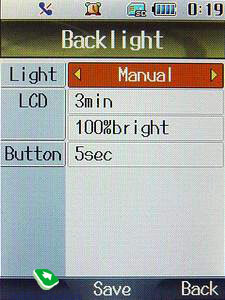 This screen does not fade in the sun – information can be read from the display at any angle and in spite of other models colors don't invert here. 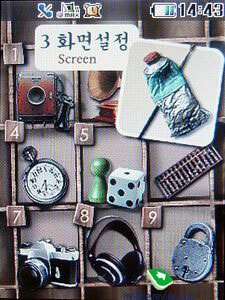 On the left from the display one can find four keys – for launching MP3-player, games, turning on either the timer or Bank-On function (useless for us) and activating flash gun or executing DownTown application. 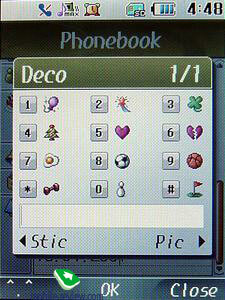 Functional keys are located under the display from left to right: call key, call record, main menu, photo album, search in the phonebook, and end call key or stand-by mode button. 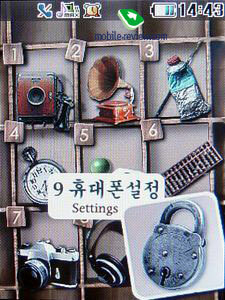 All numeric keys are placed even lower and a bit deposed to the left, at the right from them you will find the navigating key with backlight indicators along the edges – this key leaves an impression that it's made of metal, though it's not exactly right, actually the material used here is hard plastic with corrugation in the form of concentric circles. 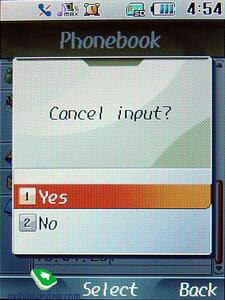 Precisely below one can find key for fast access to the menu, which also serves as a cancel key (delete). All keys are have even amber backlight. The keys' gap is low, so it's not always convenient to work with them, further more, people who usually type long messages will find them completely unfit – of they can be got used to them, but only if you press buttons with your nails. 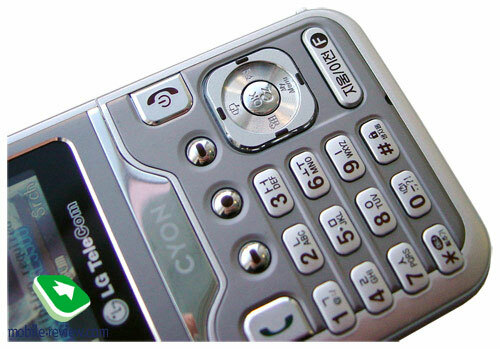 However the navigating key doesn't have these issues, it reminds of the same button in LG M6100 model, where the edges are a bit higher. 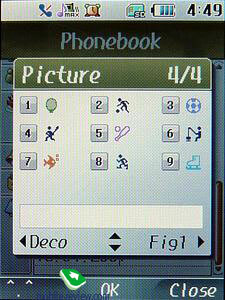 The models for different mobile operators differ only in the appearance of the first item on the menu. Technical characteristics and settings are always the same. CPU frequency surpasses even some processors, used in smartphones and PDA and owing to optimization, switching between various items on the menu is really fast. 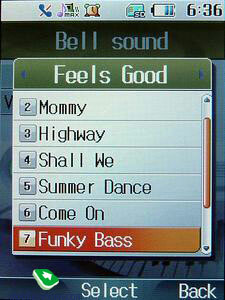 There are two ways of displaying the main menu – the first one uses the grid consisting of nine old-fashioned icons, and the other one is a big animated pictogram made in the youth style. For both of these two types you can choose pronunciation of the items – the language will be chosen automatically, depending on the applied language in the settings. Browsing the menu can be done in both horizontal and vertical planes; all items on the menu feature shortcut numbers system. 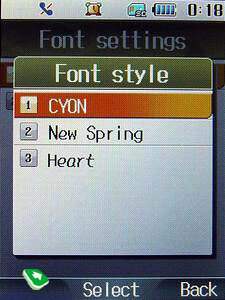 For a change one can setup font style out of three preset ones, and also change color and size of symbols, used for typing messages and entering telephone numbers. 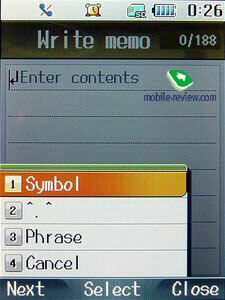 Each section of the menu can be bound up with shortcuts, making it possible to access them from stand-by mode. In case you have key lock activated, you're at liberty to dial one of the emergency numbers by pressing the left soft-key or switch the lock off by pressing the right one. 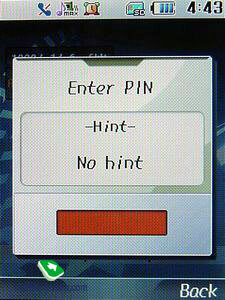 When turning the device on, you'll be offered to enter your PIN – in case you type all 4 numbers correctly you won't need to confirm the action. On one hand it's an advantage, since it speeds up the login process, but if you come and think of this, if you enter wrong numbers, the handset will consider this as the first try, so you'll have only two more attempts before the phone will get barred. 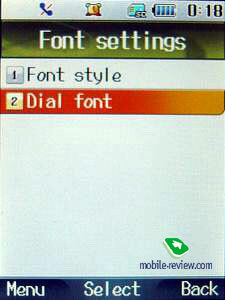 In case the handset has the SIM card of a certain mobile operator plugged in, the menu icons looks like the operator's logo. 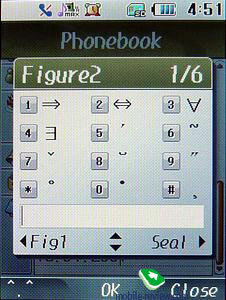 The major difference from all other common phonebooks is that this section includes all functions that have relation to mobile operator, so roughly speaking should you have something going wrong in this entry, you are to direct this problem straight to your mobile operator. 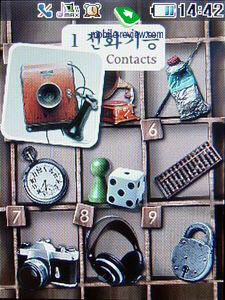 Each entry here can include up to 5 phone numbers. 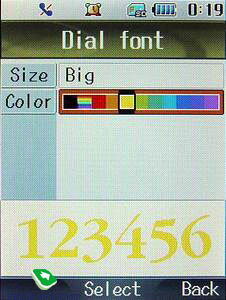 On default the home number icon will be bound up with the first submitted number, and after this you will be able to change it to one of the following: mobile, home, work, other and fax. 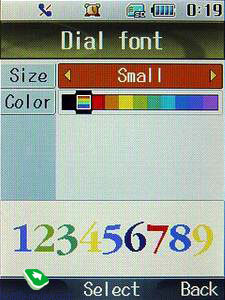 The “Name” field has the cap of 16 symbols, and e-mail address field is limited to 32 symbols, though you may have two e-mails at once. 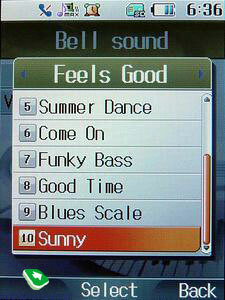 The next section you're offered to fill in is groups – you can either choose one out of the four preset ones, or create your own from a separate menu. 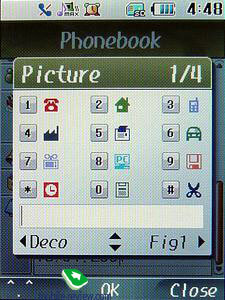 Photo in the phone book can have the maximum size of 120 х 200 pixels. 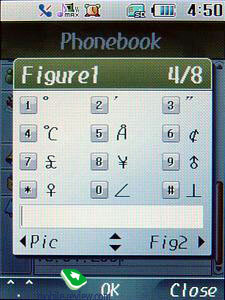 Some more info on various fields' limitations: if you want to enter MSN or ICQ number you'll have 32 symbols at your disposal. 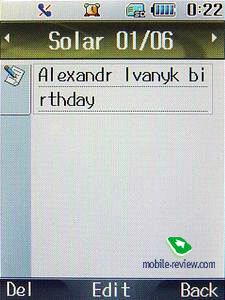 For those, who use handsets as birthday reminders, the developers included the proper date field, though it includes only month and day – maybe because all Eastern people don't count their winters after their thirties? It's hard to say what considerations this origins from, though starting from my own experience, I couldn't guess a person's age even after spending almost a year in Asia . The phonebook is capable of storing up to 1000 entries (up to 80 symbols per number), for each of them you can set a particular ring tone. 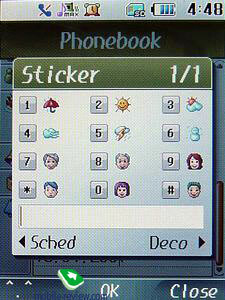 On default you are directed to the general numbers list, when entering the phonebook, therefore in order to select a particular group, use horizontal deviations of the navigating key. 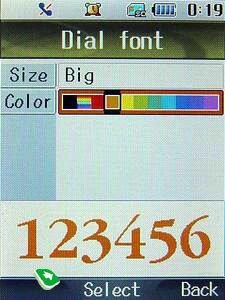 If so happens that you need to change a number, featured in an entry, simply press the same navigating key horizontally when highlighting the desirable entry. Besides phone number selection you can also check the ring tone, birthday and read notes. 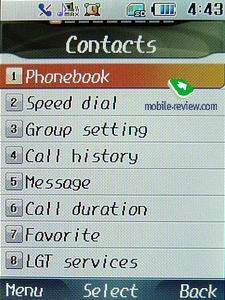 Also the entries in the phonebook can be sorted not only by groups but by first letters, which are displayed in the horizontal list; therefore you won't have any problems with finding the exact person even in a full phonebook by name or e-mail. 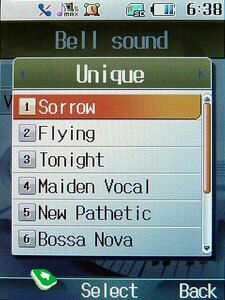 In case you're tired of pictures, displayed next to the entries, you can turn them off from this very menu as well. 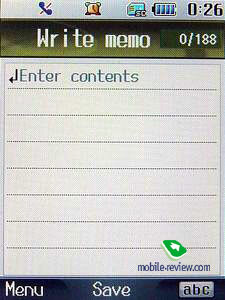 By pressing # button you mark the current entry, so you will be able to send SMS to all the selected people. 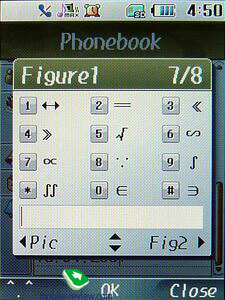 Moreover, if you feel uncertain whether the message will be received when sent to one number of a certain entry, you can add all 5 phone number fields by pressing the navigating key horizontally. Each of the entries can be made secret, thus when selecting this name you won't be offered neither the list of submitted numbers nor any information at all – instead you'll see “Secret” tag covering all fields. To gain access to these details, you'll require entering the PIN-code. Rather uncommon approach to secreting information – for example in handsets by Sharp, secret numbers are not displayed on the general list, but can be called up through checking the proper option in the Security sub-menu. 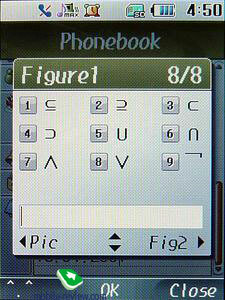 In the end we can rightfully say that the phonebook of the Korean model differs from the ones featured in the other ones as much as your handset's screen is different from your monitor. 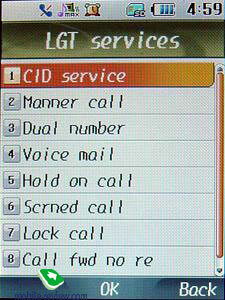 The programmers spent a great deal of time to change the volume of useful information that can be added to the phones being on sale in CIS. As you can see, these efforts weren't a waste, since all requests have been looked into and considered, but these solutions are still available only on the Korean market. 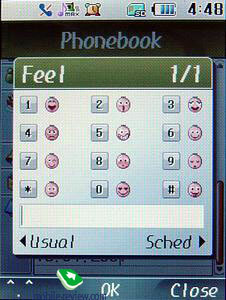 Speed dial. 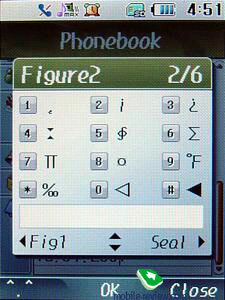 The section can be accessed by pressing end call key while in stand-by mode. The device allows using all 99 slots for both any phone number of a certain entry, and any number on the general list. 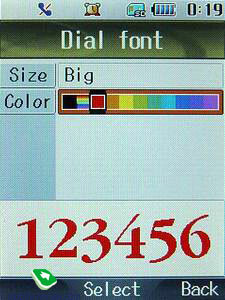 Having pressed, for example “ 2” while in stand-by mode, you will see an entry, which is bounded up with this number and under the name the corresponding number will pop up. Groups Here you are offered to either edit the existing groups, or make up your own (a group's title may consist of 24 symbols). 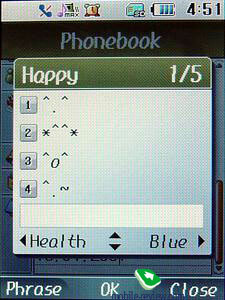 In all 31 groups over the default ones can be added. In this tab you can also set ring tones for calls and SMS for each available group. 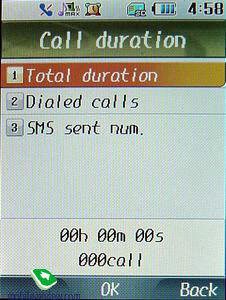 Call record . 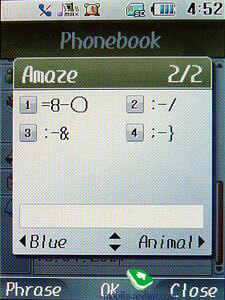 Even though the handset fit my hand like a glove and all, I couldn't make a call in the end, since SIM-cards of our mobile operators don't support voice communication, that's why we can only make wild guesses about this function. 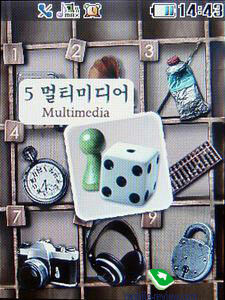 One more tab of the menu where I could rely only on my intuition and familiar icons. 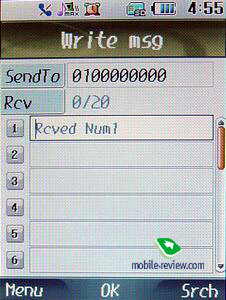 While typing an SMS you are offered to choose a number, which the answer will be delivered to, and the list for a group message out of 20 available. 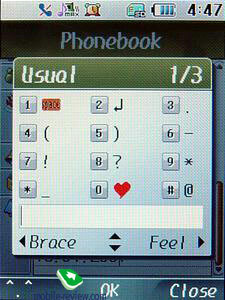 A message can be only sent to one of the numbers from the phonebook. 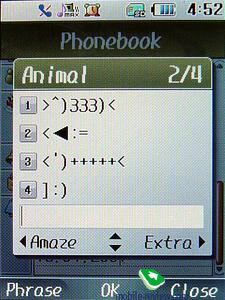 The maximum length of an SMS is 80 symbols – you'll be warned by a special indicator that the message is full, though if you intend to send someone a long message, the cap can be extended to 240 symbols, in other words three pages. 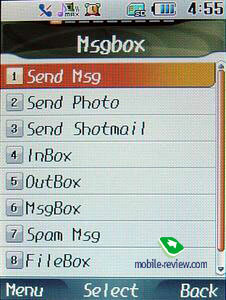 Right here you can check the option for saving all sent messages in Outbox, choose delivery type – if possible, normal and fast. 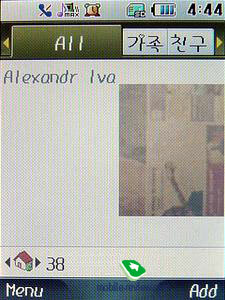 Function of sending a photo is singled out – from this tab you can send messages with photos, actually this is some kind of simplified MMS. 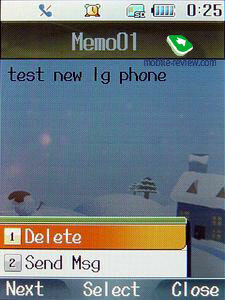 No possibility of attaching other files, with music for example, is offered in the handset, while the limit of attachments is set to 5 with no caps in size – when attaching two photos with total size of 4 Mb, the phone doesn't warn you that the maximum size is exceeded. 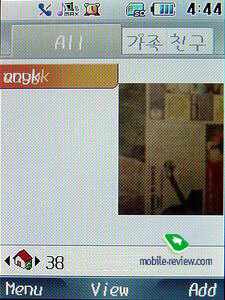 Owing to this one can imagine what possibilities are provided by the mobile operators in Korea , if the phone allows sending such big messages. The peak of data transferring speed in CDMA 2000 1x EV-DO networks reaches 1 Mb/s, this means that sending a message of this kind there won't take longer than sending an MMS in the conditions of our networks. Amount of symbols is almost unlimited – well, of course it has the cap, but I assure you, you won't have enough patience to type this much. Shortmail can include up to 2560 symbols. SpamMessages function has its own sub-menu. 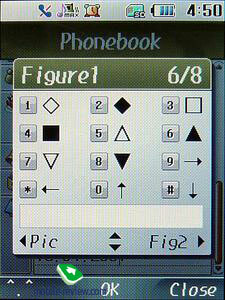 All pieces of multimedia information, received via messages, are stored in FileBox folder. 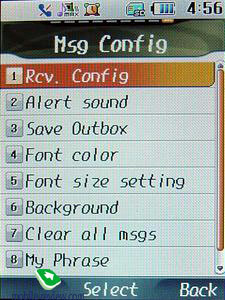 Such parameters as font size, style and background can be adjusted for any type of messages. 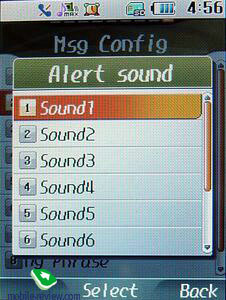 Among other settings one can note sound selection, ring tone, vibrating alert adjustment options, time span between repeating incoming messages signals, in case you forget to read it. 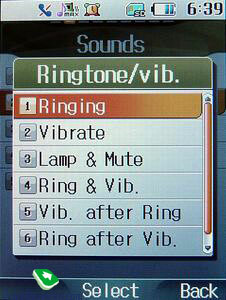 List of available ring tones includes 10 items. 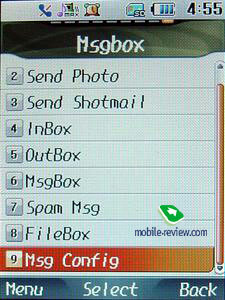 Mail sorting can be done by date, subscriber or attachments. 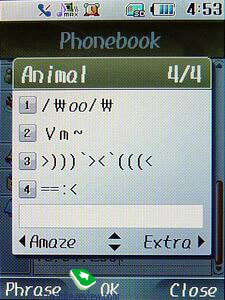 When receiving a message one can choose displaying either the entire body of the message, subject only or subscriber's name. 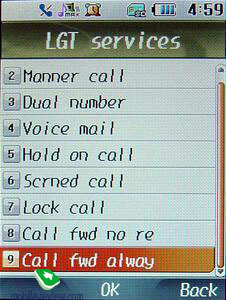 Here all information on dialed numbers and incoming, outgoing, missed calls is stored, besides this, the number of SMS-centre can be peeked in behind this tab as well. 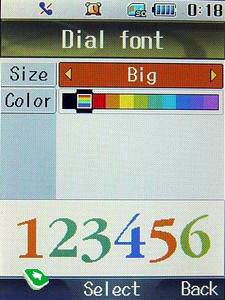 Shortcuts of Internet-pages – site's title can have maximum of 20 symbols, while URL-address can consist of 245 at its highest. 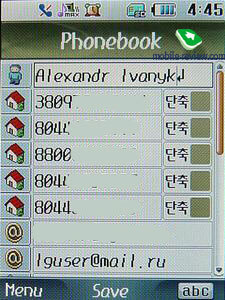 I failed to find something special behind this tab – as usual call divert, voice mail number and calls barring can be set up here. 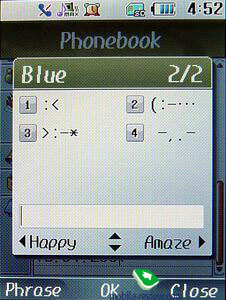 Behind this tab one can find all settings related to ring tones and sound effects – no profiles are incorporated. 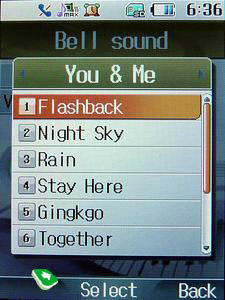 Melodies. 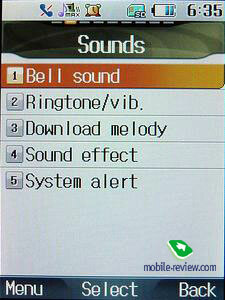 If you have decided to set one ring tone for all incoming calls, you are at liberty to use one of the 50 preset melodies or upload some using mobile operator's service. 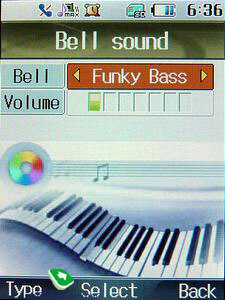 In order to sort out all these sounds, there are 5 groups with 10 ring tones in each. Volume is regulated with the help of the seven-scaled bar. 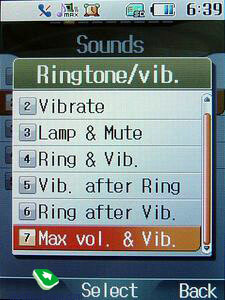 Ring tone/vibrating alarm. 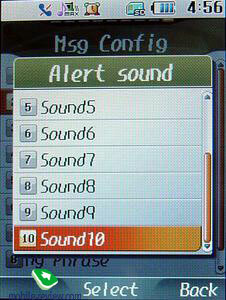 This is the title of the tab where all settings related to vibrating alarm and ring tones can be attuned to your tastes. You can choose from: ringing, vibration, lamp and mute, ringing and vibration, vibration after ringing and ringing after vibration. Sound effects. 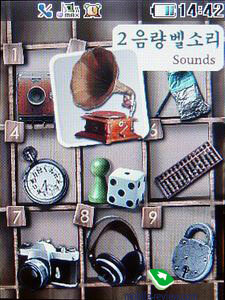 You can setup various sound effects for pressing the keys, for example Xylophone or Water drop. 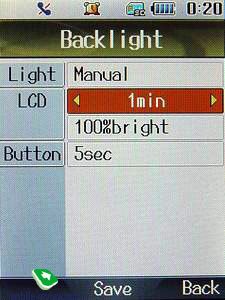 Volume level can be changed from 1 to 7, also you can turn off all signals. 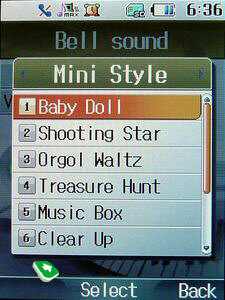 Menu browsing has four different sound effects – three of them don't feature anything special, but the last one offers pronunciation of every chosen item on the language, selected as the main. Handset's startup and shutdown can be followed by four different melodies. 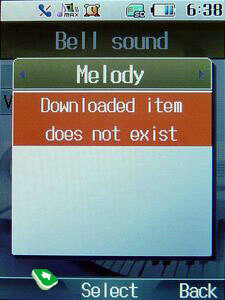 Any of the sounds available for adjustment can be turned off. Service tones . This sub-menu features the following options: cybervoice, network loss signal, and minute beep. 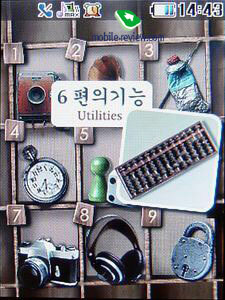 All there items can be either checked or unchecked . 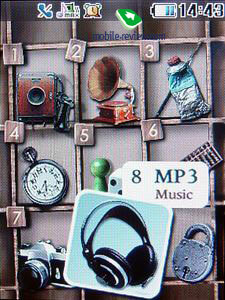 Every thing that you will see on the display can be set up here. 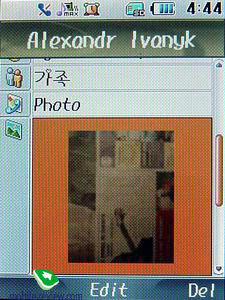 Any files with .jpg extension, and resolution varying from QVGA to 5 mpix photo, can be set as the wallpaper. 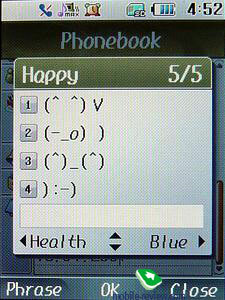 On default the handset offers six pictures that can be applied as the background. 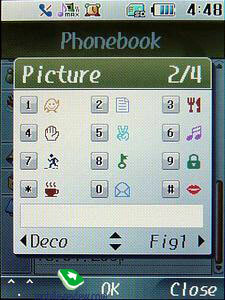 The same number of pictures is intended for incoming calls, device's startup/shutdown, and as an addition – three over these ones, specially selected for the latter options.. 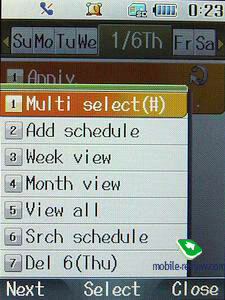 In sum six appearances are available for the calendar and clock, you can also uncheck the option for displaying them while in stand-by mode. Actually, this title is applied to an option common for us – the item - Greeting message, that's displayed while the device is in stand-by mode. The amount of symbols is limited to 16 – the greeting can be placed either in the left or right corner, in the centre and set up as a creeping line. 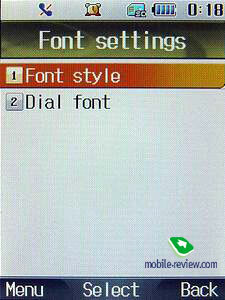 The text itself can be displayed on a transparent background, or against the background of one out of nine colors. 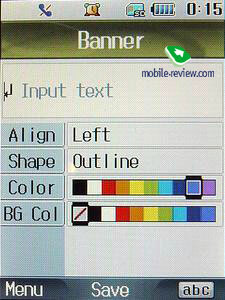 Right here one can adjust text color and symbols' frames. 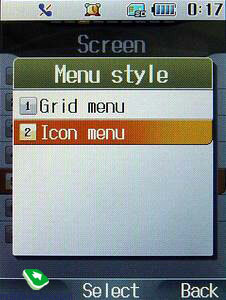 The way of displaying the menu can be chosen from the two available – grid menu, where all nine items are on the screen; and icon menu. 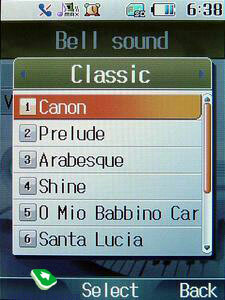 When the former variety is applied, a horizontal scroll bar appears under the highlighted icon. 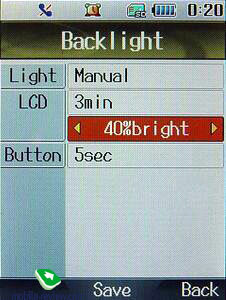 On default the backlight color is regulated by the handset itself, but it can be manually adjusted. 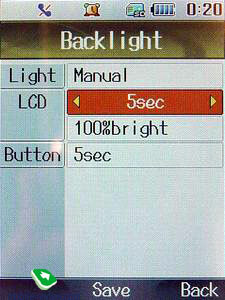 Among settings here are brightness level (from 100% to 40%), backlighting time after pressing the buttons (5, 10, 20 seconds) and display's backlight (5, 10, 30, 60 and 180 seconds). This function terrifically differs from everything we have used to see in the European handsets models by LG . 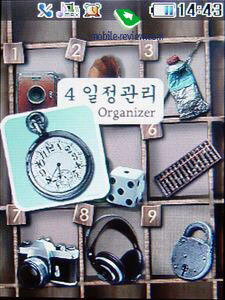 Firstly, besides calendar and notes, there are Anniversary and D-day counter items available on this sub-menu. We'll take our time and review each of these options. The core feature here is that the calendar doesn't show current date when entering any section, thus you are forced to choose it over and over again. But if you have selected current date and later on decide to check out which day of the week the New Year falls on, then by pressing the soft-key on the right (Today) you will be redirected to the day you chose when entered any item of the Organizer menu. 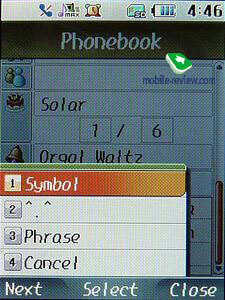 Search in the organizer (all sub-items) is conducted by text, with the maximum symbols cap of 30. 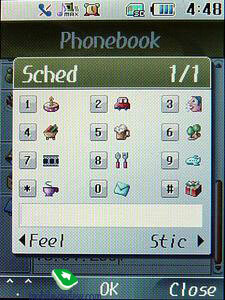 The calendar stores 160 cells and up to 80 symbols in each. 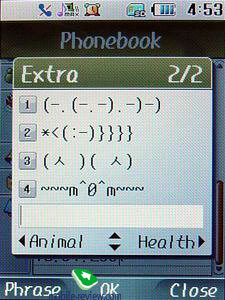 Among settings there are entry's start and end time, text, sound effect (15, 30, 60 minutes, 1, 3, 7 days before the task or no reminder at all) and alarm repetition (daily, weekly, monthly or yearly). When “Remind daily” is checked, you can choose either repeating the event everyday, from Monday to Friday, or any selected week days' numbers, for example “3, 4, 5” . 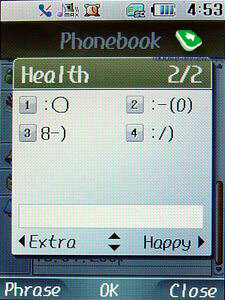 And when in “Remind weekly” mode, the task can be repeated either daily, or on any selected day / week of a month. 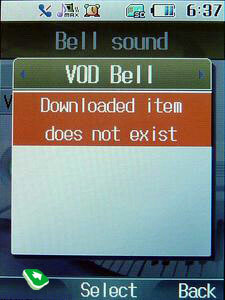 Date of entry ' s deletion can be set up here as well . 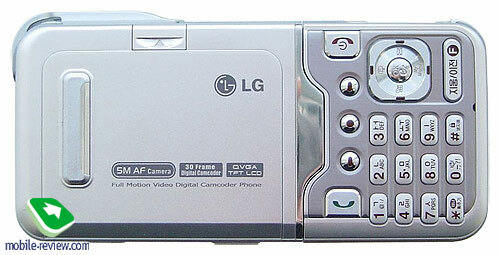 This item doesn't appear to be any different from the similar ones in other models by LG. 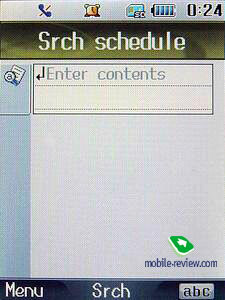 When entering To-Do tab, the first thing that pops up is monthly view of the calendar. 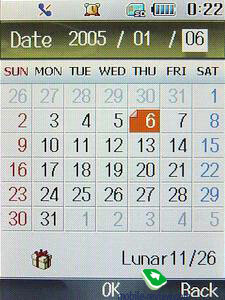 To select a certain date, you will require using the line above the calendar, after this you are directed to the day, stated on the top of the screen. 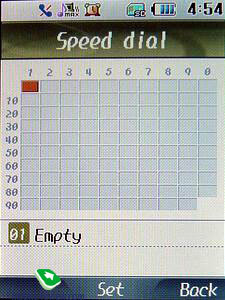 All entries, if there are any, will be displayed on the list – the limit of records is set to 80, while each of them may have a text note up to 80 symbols in size; here you can set priority (high, normal, low), task's status (Doing, Done), and set up a sound effect for the exact time (year, month, day, hour). 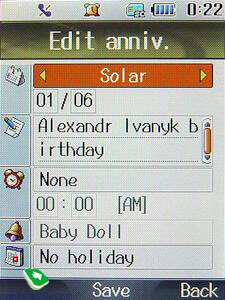 Anniversary (Birthday) . 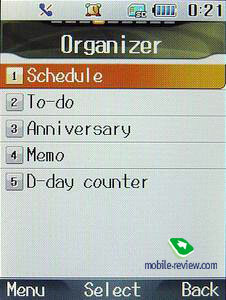 Similar to the other sub-menus featured in Organizer, when entering this item you are directed to the calendar with the current month being shown. Having chosen any day, you will be offered list of all birthdays that were entered in this item, or located in the phonebook, if you have filled in the appropriate field. 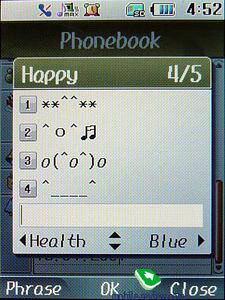 Each entry may consist of 80 symbols, mark about type of calendar (lunar, solar or hand – I couldn't find out what these stand for), reminder time (1 day before, on the birthday date or no reminder) and any of the ring tones, stored on the handset. At the very end there is a funny checkbox, which determines whether to show Holiday icon, when entering the calendar, or not. Besides displaying all birthdays in the general list, you can choose displaying them monthly – in this case the upper part of the screen will feature a horizontal line with months, and a bit lower – numbered lists of birthdays. 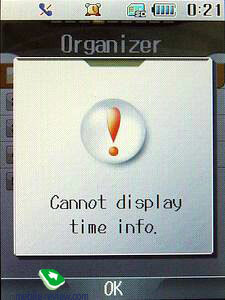 The only item of all presented in the Organizer menu, that meets you with the list of entries, rather than the calendar. 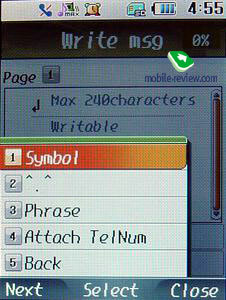 Maximum number of notes is 40 with 188 symbols typed in each one. 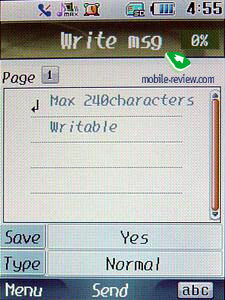 The settings pool here is rather poor, since you can adjust only the background, which the notes will be displayed against. D - Day counter . Personally, I was not able to figure out what's what in this tab, but as far as I can understand, this counter is supposed to countdown days. 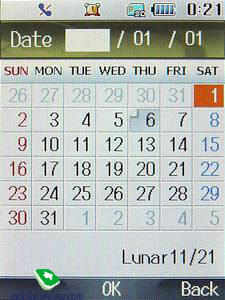 For example if you fill in a birthday date, the counter will indicate how many days left.